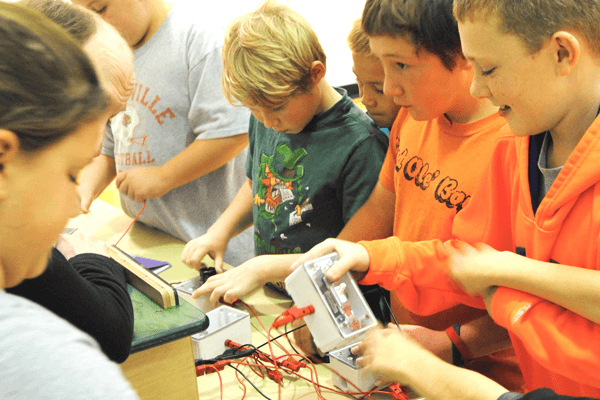 Five hands-on science activity stations, presented in a fun, festival atmosphere. Great for community, family, or after-school events. Stations explore animal camouflage, habitats, tracks, and animal specimens. Activity stations highlight Science, Technology, Engineering, and Math through bridge building, animal explorations, chemical reactions, and more! Activity stations explore the forces of earthquakes, roller coaster motions, and the power of magnets. Activity stations get messy with Alka-Seltzer® explosions, sensory concoctions, and slime. Activity stations explore soapy science with the properties of surface tension, buoyancy, and light! Activity stations explore adaptations, food webs, and structural characteristics. Activity stations investigate the inner workings of the human body, by exploring the circulatory and digestive systems, and ocular anatomy. Activity stations navigate the stages of a storm by exploring wind speed, pressure, lightening, and hail. Activity stations highlight the different fields of engineering through a series of design, team work, and building challenges. Activity stations explore how different kinds of scientists utilize math: "the universal language of science." Activity stations experiment with chemistry through explosive reactions that test properties of matter. Don't See Your Ideal Expo? If you have a theme of your own, we can design a KAS-based experience around it! Just book six weeks prior to your desired program date.